Remember when you could make finely-tuned and precise adjustments to your metal lathe? The WEN Digital Readout Kit installs easily to the cross slide and compound slide of your lathe to help you know the exact depth of your cut. Choose either inches or millimeters depending on your preferences. With maximum accuracy, you'll be able to measure adjustments as small as 0.0005 in. or 0.01 mm in size. While this digital readout was designed with the WEN 3455 Metal Lathe in mind, its universal build will fit on the majority of 7 x 12 in. metal lathes on the market. And because its a WEN product, your digital readout kit comes backed by a 2-year warranty, a nationwide network of skilled service technicians, and a friendly customer help line all to make sure you remember WEN. 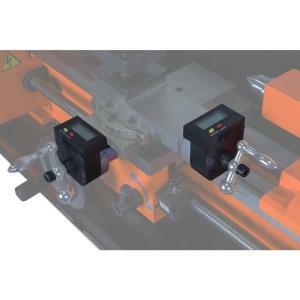 Tbook.com crawls the web to find the best prices and availability on Lathes and related Tools and Hardware products like Wen 2-Axis Digital Readout Kit for Metal Lathes. For this page, related items include products we find that match the following keywords: "Lathes" at our vendor partner Home Depot. Wen 2-Axis Digital Readout Kit for Metal Lathes is one of 3 Lathes and related products listed in the Tools and Hardware section of Tbook.com If you have any questions on this product, please give us a call at 734-971-1210 during the hours of 9am - 5pm EST for assistance. Thank you for shopping at Tbook.com, the Internet Department Store!